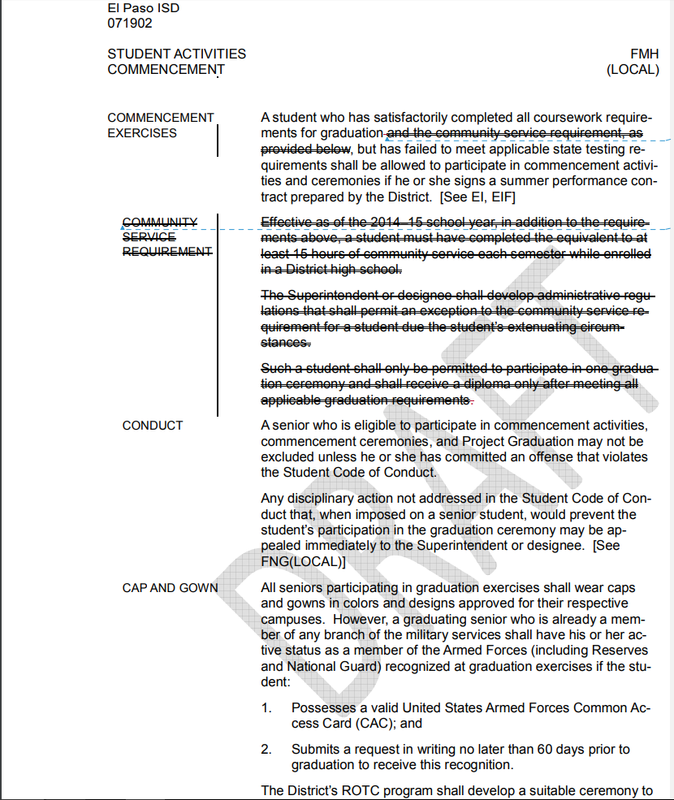 Back in 2014 whichever group was in charge of EPISD established community service requirements for high school graduation. This entry was posted on Tuesday, November 14th, 2017 at 5:10 AM and is filed under El Paso Independent School District. You can follow any responses to this entry through the RSS 2.0 feed. You can leave a response, or trackback from your own site. The district has no way of tracking whether students have actually done any community service. The students enter their service honors on a website, and they do it on “the honor system.” Many students are, of course, conscientious good people and actually do the community service. But many just enter numbers on a website. No mention of what a summer performance contract entails. This is instead of passing the required state tests? Also, this is just for the right to “walk” at graduation but not an actual means of getting a diploma. Personally I think the “walk” without a diploma is meaningless but I support giving any student the right to “walk” if that is a way of avoiding embarrassment and if they agree to some kind of exit plan to work on passing the state exams. As for the community service requirement I’m surprised it would be dropped with Ms Byrd on the board….how did she vote or was she outvoted? Community service is a good (former) requirement. If you want something for the students that will do them more good than community service why not require them to watch 20 hours worth of Ohio and Pennsylvania Hi-way patrol movies of accidents they filmed. All teenage drivers should be required to view these movies. Many will get sick but the message will stick with you for life. This is a mistake. This program has no cost. In recent years, I have encountered several students who were seeking or doing community service to fulfill that requirement. Unlike what Dan Wever says, all the students I observed were involved with non-profit organizations, not businesses looking for free labor. Some students took their service requirement seriously. Some were enthusiastic. Some worked together for a single organization, which is another non-sports way for students to learn teamwork. Some were resentful and just going through the motions. Some will continue to give back; others won’t. But the benefits of a community service requirement outweigh the downside. One of the most important things people need to learn is that service to others is important and “giving” isn’t all about just writing a check. Frankly, young people should be required to perform one or two years of military service or public service. This is the problem with people that think that all students have the same time to do things. They do not, many need to work for money to support their family. No, Dan, don’t tell me what I think. I would give a waiver to those who need to work to help support their family and can actually show that they have a paying job after school. That makes more sense than killing an entire program that has positive benefits. Good to hear from you Deputy Dawg. This is good. The community service requirement was good for the businesses that got free labor help but many students used every spare hour working to help their families eat. The appeal to the Superintendent is also good. At one graduation I attended there was a girl sitting in the tunnel crying. I asked her what was wrong and she said that she was not going to be allowed to walk with her class. She was about 13 months pregnant just looking at her. I checked into the reasons for her not being able to walk and found out that a rule was established at the school that if you did not make a morning meeting the day before graduation you could not walk. This girl was in Special education and had a doctor’s appointment the time of the required morning meeting thus she was not allowed to walk. As a trustee, I was unable to intervene on her behalf as graduation hour was upon us and I still feel bad 15 years later for not being able to help her. This little girl was cheated out of a unique experience in her life because of an adult that did not want a pregnant student on stage. I don’t think volunteering for a business would count toward a student’s community work. I am in an organization that benefited from students fulfilling their community service. The students learned quite a bit not only about volunteering but also about the environmental projects we were working on. Hopefully those students will care more about environmental issues as adults. I think abandoning student’s community service is a mistake. I seriously doubt the community service requirement was ever enforced. I think it’s more important to enforce academic requirements and let students learn the importance of community service on their own. This doesn’t come as a surprise. They altered the goals, now they have to alter graduation rates to meet the goals. Geeeeeezzzz. Why so much failure for episd after all this money. And district charter schools? They have lost their focus on local for outside ideas. How shameful of them. They will waste more and nothing will be done. Move to nm is barely an escape from this madness.